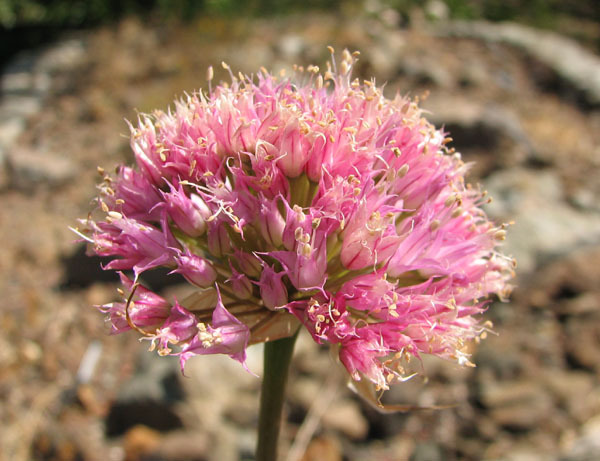 On these pages photos of North American Allium species will be featured. There are approximately 130 taxa in North America, almost half of which occur in California as the center of diversity. 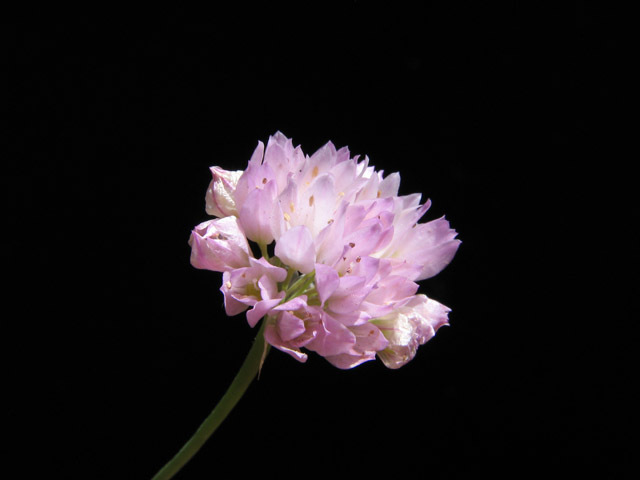 Besides a few species that are widely grown, namely Allium cernuum (nodding onion), the Californian A. unifolium (popularized by the Dutch bulb trade) and the lesser known A. stellatum (prairie onion), the North American onion species have been largely ignored by the horticultural world. 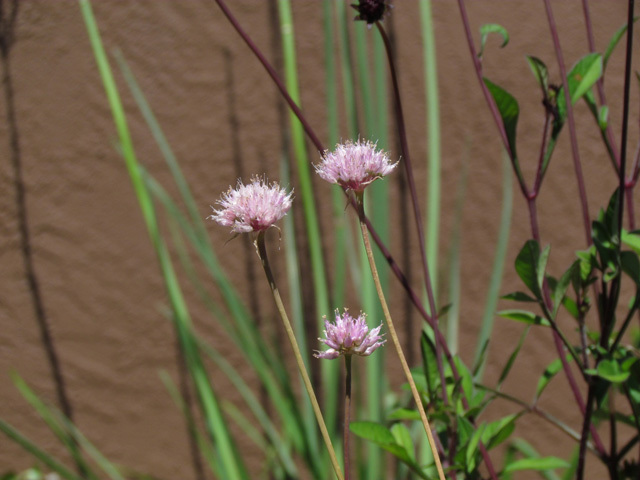 There are also about 15 species native to Mexico, similarly rare or absent from horticulture. Eastern American species generally need a cool - cold winter dormancy period with some to lots of rain. Western American species, especially those in the Pacific States follow a Mediterranean pattern where they need a moderately cold wet winter and a cool dry summer. Taxonomically, there have been few changes in American species. 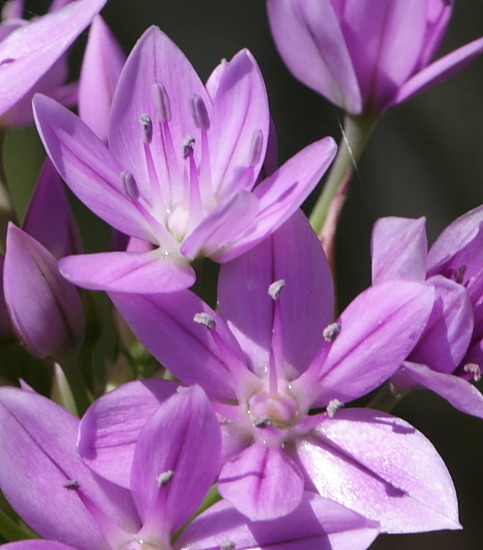 A phylogenetic study by Nguyen et al, 2008 found that North American alliums are distinct from European species and those occurring in the California Floristic Province (CFP) are mostly distinct from eastern American species. 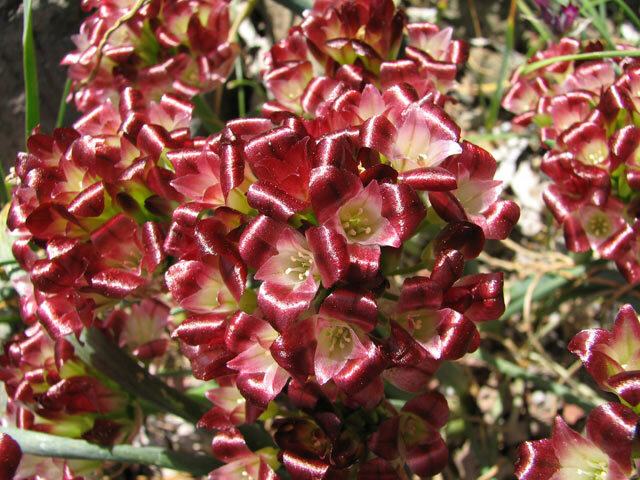 California holds a wide variety of species whose forms are distinctive in leaf and bulb coat morphology. 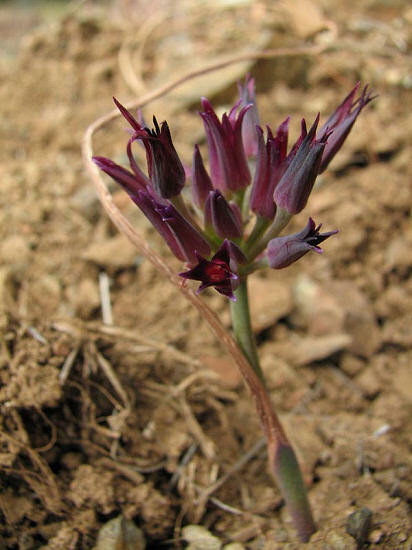 Species related to Allium falcifolium form falcate leaves whereas species related to Allium jepsonii form a single leaf from which the inflorescence emerges on the side. 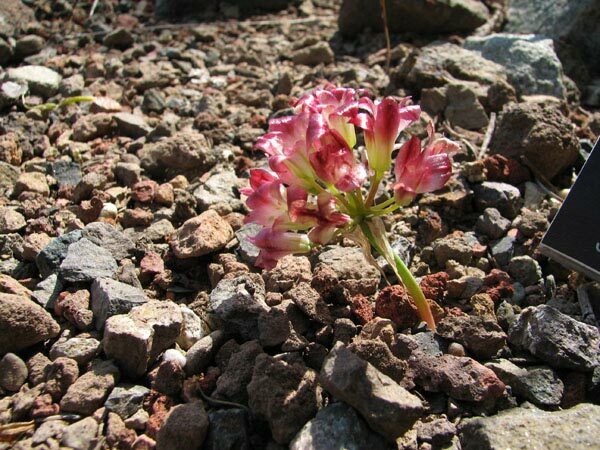 Many CFP species have also adapted to a special type of soil called serpentine which is very high in minerals such as magnesium, making it toxic to many plants. 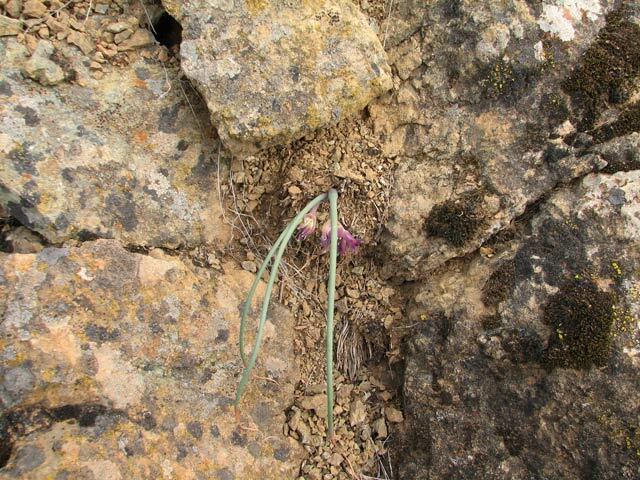 Some Allium species are so adapted that they can only be found on serpentine soil in the wild. 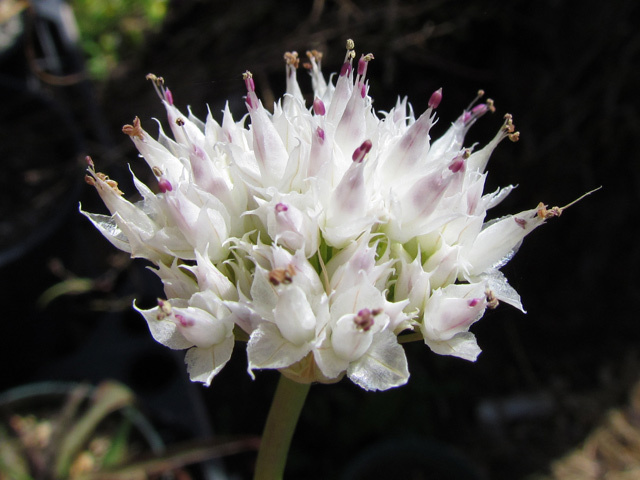 American alliums from S-Z are found on this wiki page. 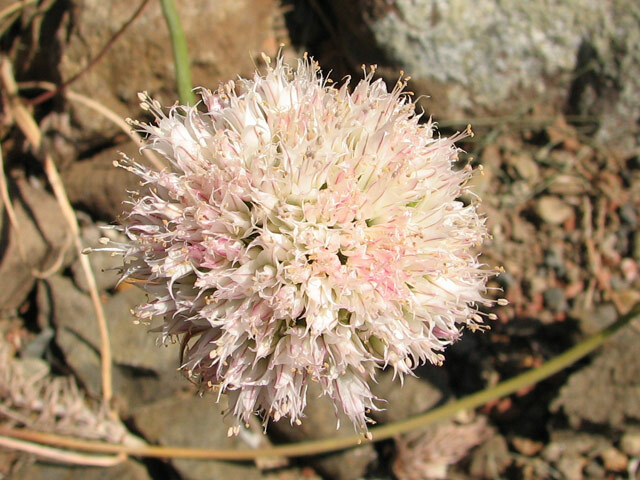 Allium sanbornii is a large onion restricted to the Sierra Nevada and southern Cascade foothills of California. It is only found on serpentine outcrops. Photos by Nhu Nguyen. 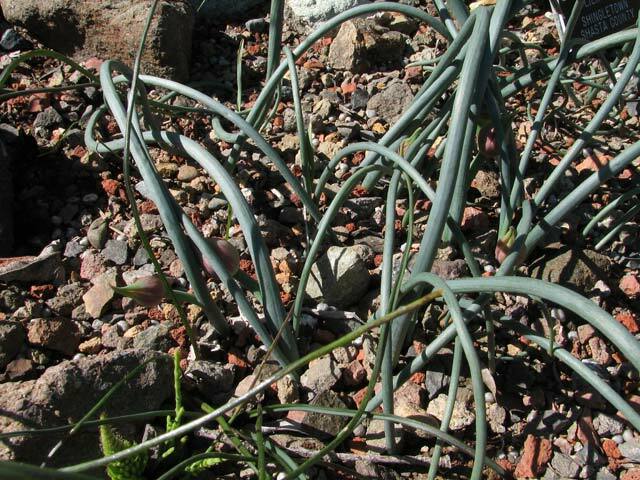 Seeds sprout readily and this species is actually one of the easier California onions to grow. 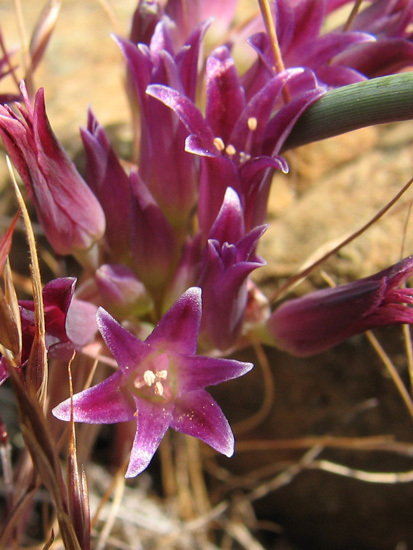 It is one of the latest blooming species (around July) when most other native bulbs have already gone into dormancy. It requires a very dry summer dormancy period. The photos below were taken by Nhu Nguyen. Photos 1-3 were of plants growing at the Tilden Botanic Garden. The photos below were taken by Nhu Nguyen of a white form of this species. 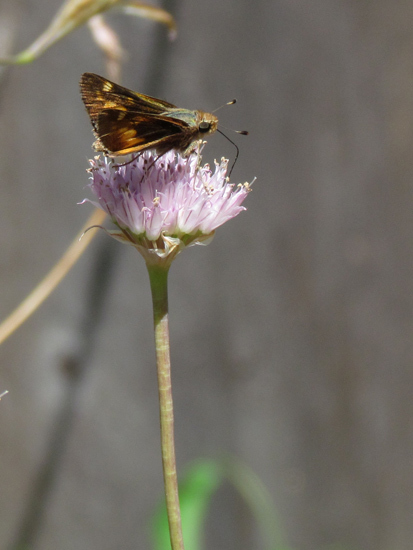 Allium serra is from the central coast ranges of California, found in grassy slopes, often under blue oaks (Quercus douglasii), blooming from March to May. 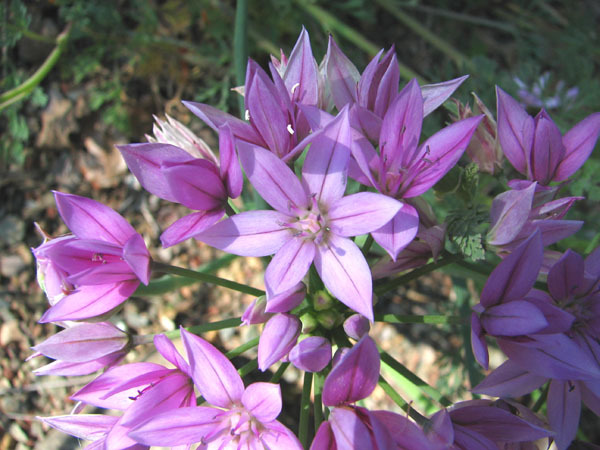 It has pink flowers which become more papery as they age. 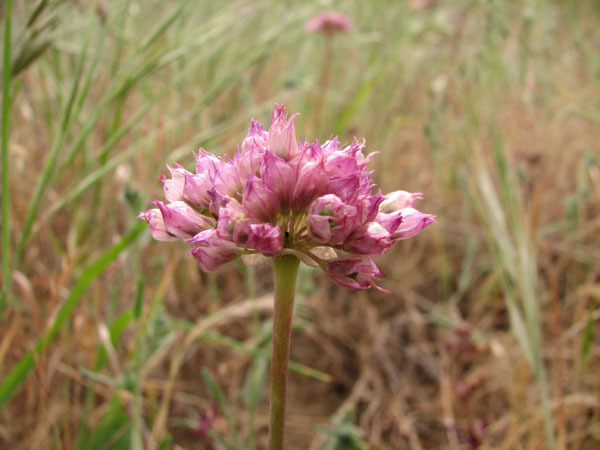 Photo 1 shows an inflorescence blooming April 2005 in Bear Valley in Colusa County, California. 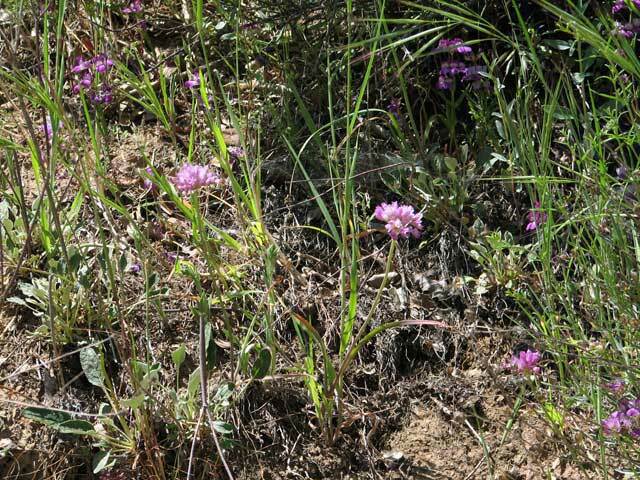 Photos 2-5 show plants in habitat near Mt. Hamilton, Santa Clara County, California. The photos below are of plants in cultivation. Photo 1 was taken by Mary Sue Ittner. Photos 3-4 were taken by Nhu Nguyen. 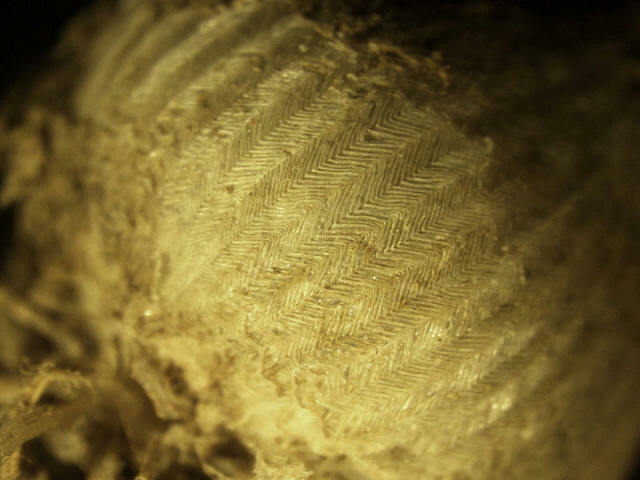 Photo 4 shows the beautiful "herring bone" pattern of the bulb scale. This character is very important to identifying this and several other related species. 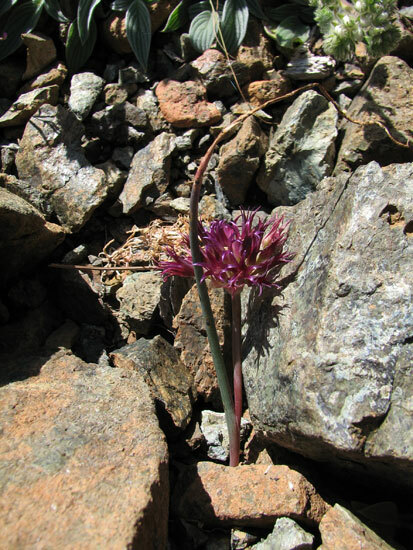 Allium sharsmithiae is a small onion restricted to the Mt. Hamilton Range in central California. It occurs only on serpentine soil. The leaves will often die down before the flowers bloom. Photos by Nhu Nguyen taken in habitat. 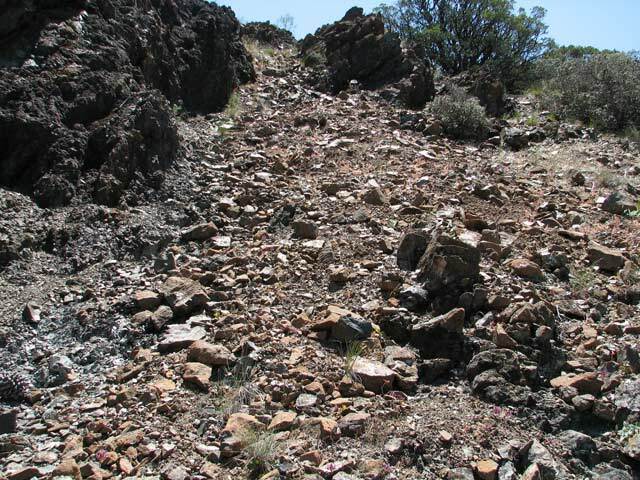 The last photo shows a typical talus slope habitat for this species. 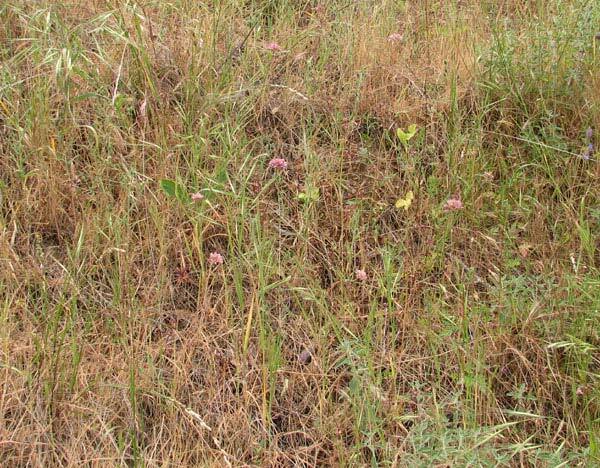 Look to the lower right hand corner and you can make out pink patches that are these plants. 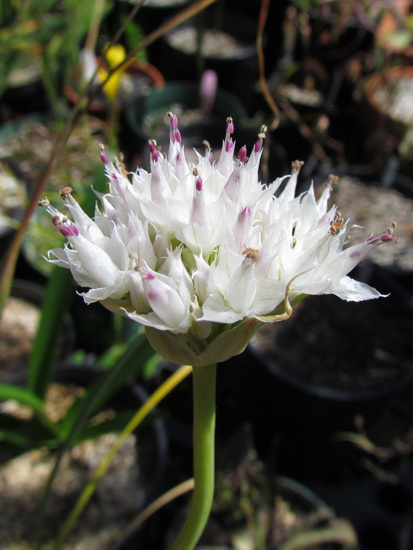 Allium shevockii is also another small but beautiful onion with a large inflorescence of dark red petals. 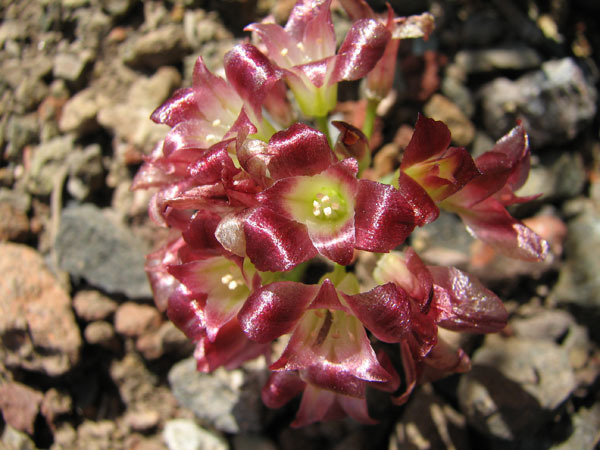 It is found only on Spanish Needle Peak area in Kern County, California where it grows on metamorphic outcrops or talus. 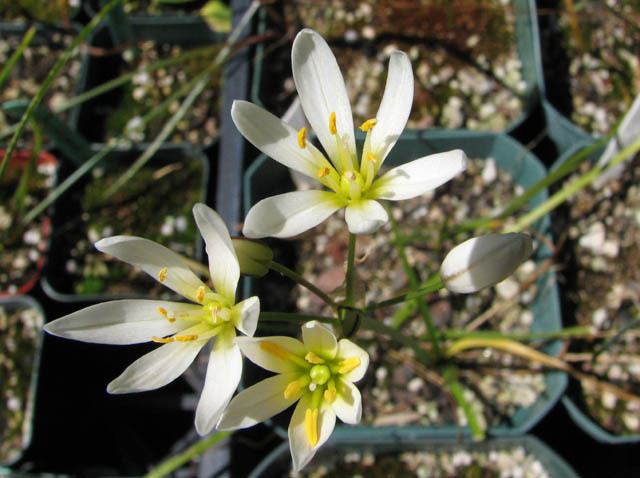 It was first collected by Jim Shevock, for whom the species was named. Photos by Nhu Nguyen at the Tilden Botanic Garden. 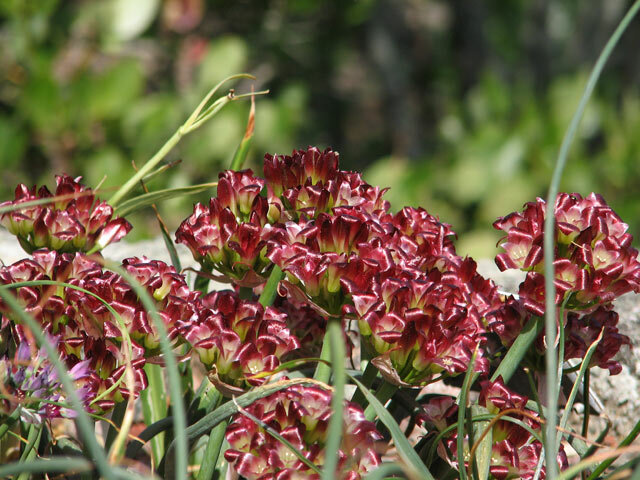 The last photo shows the glaucous and thick succulent leaves and buds. 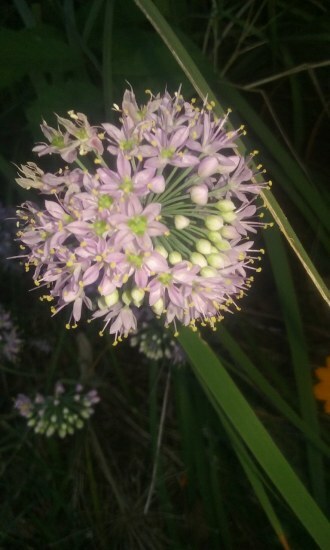 Allium sp. Seeds of this undetermined species was collected in Chiapas, Mexico. It is a nice little plant that grows and blooms well in a 10 cm (4 inch) pot. It is a summer grower and needs a dry winter dormancy. It takes 3 years to flower this plant from seeds. 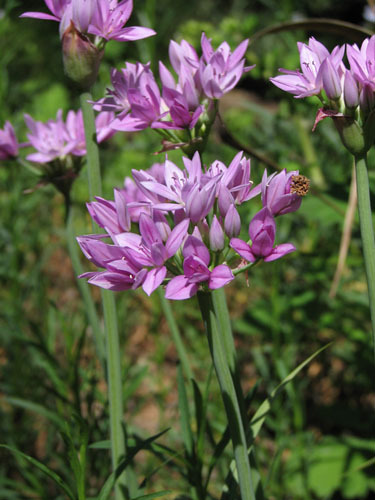 Allium stellatum Ker-Gawler is distributed from central Canada through the central part of the United States. 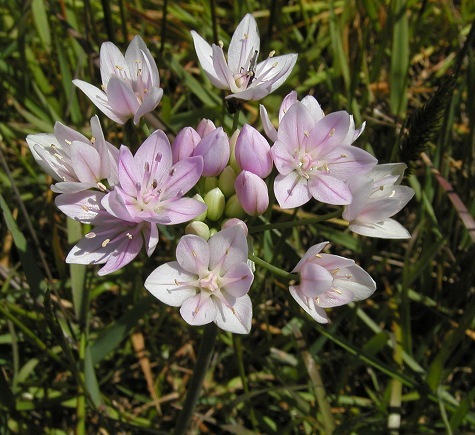 It is commonly known as "prairie onion". 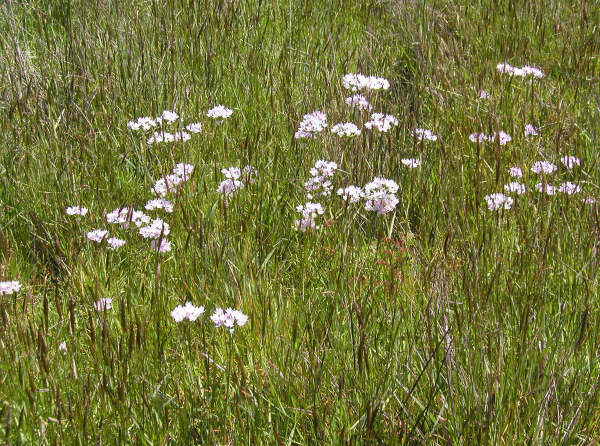 It blooms from August into October with 2 to 3 inch (5-7.6 cm) heads of whitish to lavender florets. 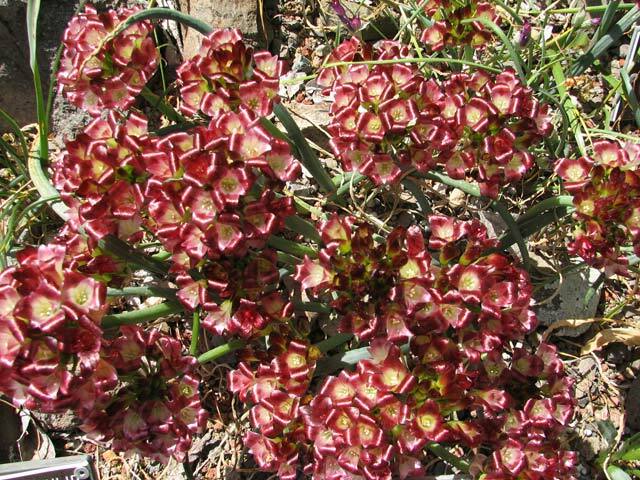 It is native to rocky soils and grows in clumps of narrow tubular foliage 30 to 70 cm (1 to 2 feet) tall. Photo from Steve Evans of plant flowering in Oklahoma September 2018. He notes that he has never seen it much more than about 1 foot (30 cm) tall. 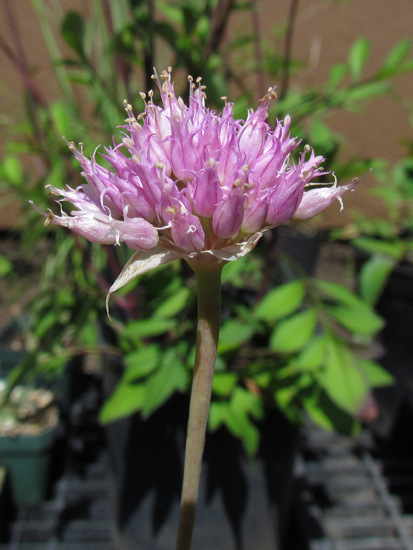 Allium texanum - a species from... you guessed it, Texas. 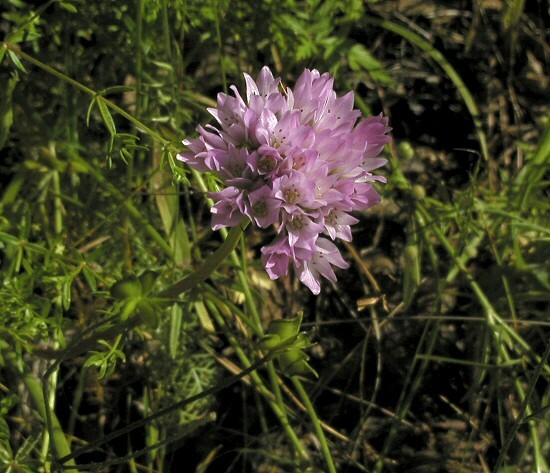 First described and published in 1990 by Thad Howard, one of several species emerging from the overgeneralized muddle of Marion Ownbey's Allium canadense var. fraseri. 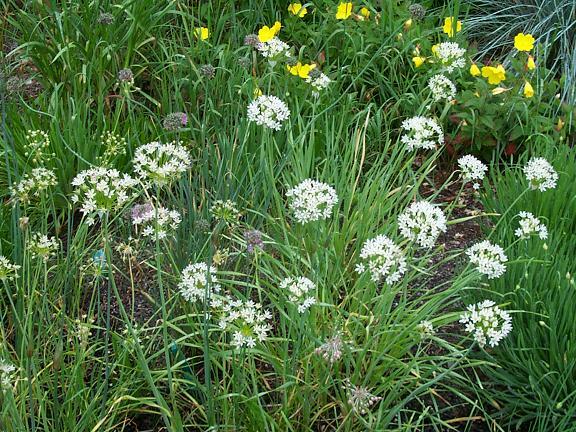 Hardy here in New England, with gray twisting foliage, and attractive white flowers in late June through July. Photo by Mark McDonough. 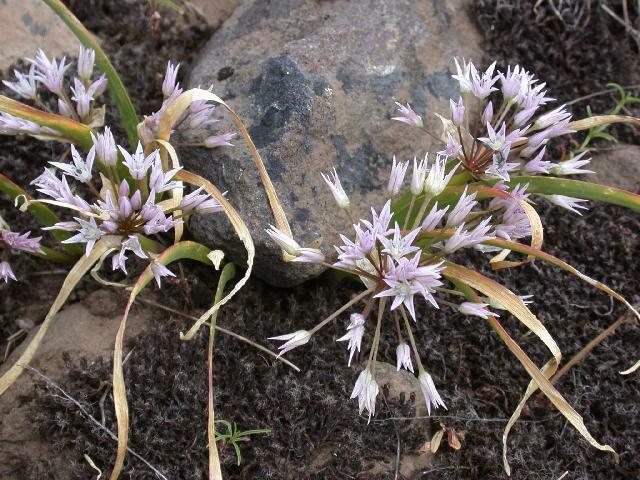 Allium tolmiei at the Lawrence Grassland Preserve (Nature Conservancy) near Shaniko, central Oregon, flowering in mid-May. 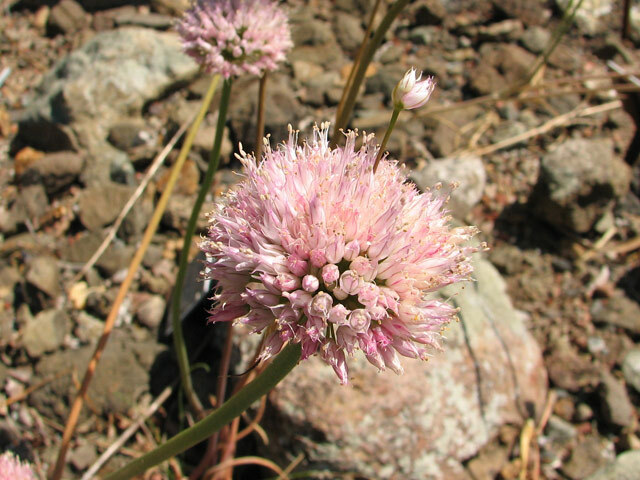 This small onion grows in so-called biscuit scabland, a type of terrain featuring raised mounds of soil surrounded by "moats" of small to medium-sized rocks, and patches of similar rock. 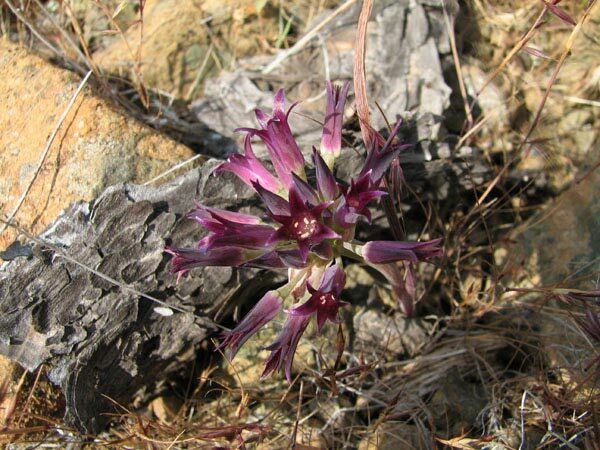 It grows only in the rocky spots, surrounded by sagebrush scrub in the deeper soils. Photo by Jane McGary. 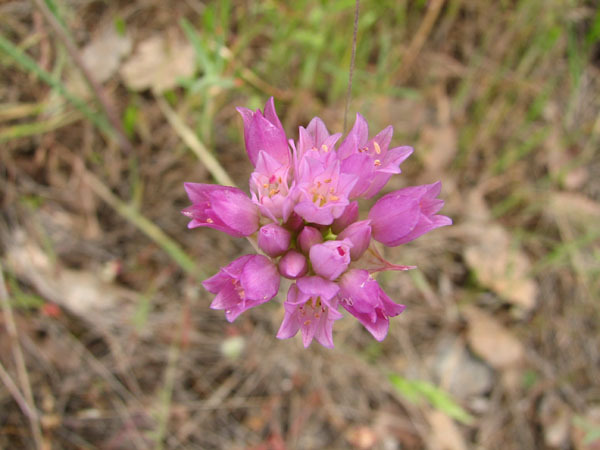 Allium unifolium is found in moist grasslands from 16 to 720 m in the Coast Ranges of California into Oregon. It flowers from May to June. 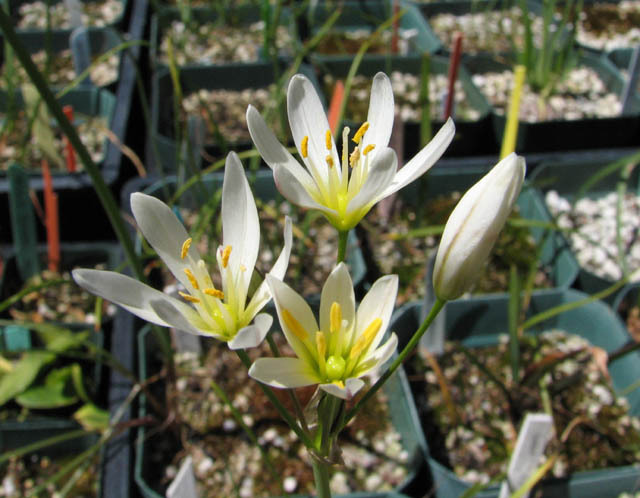 It is one of the most commonly grown Californian species as a landscape bulb and multiplies rapidly, partly because new bulbs are produced on lateral rhizomes from the outside of the previous bulb. Seeds are very viable and they spread throughout botanical gardens where they are planted. 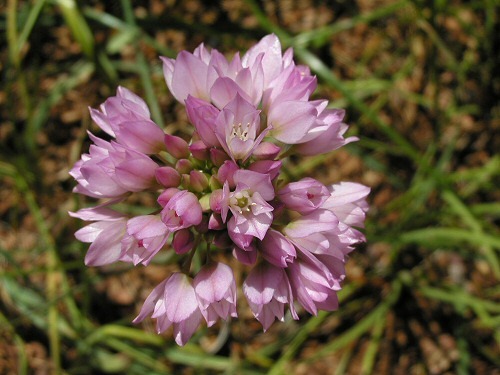 In spite of going by the common name, one leaf onion, this species has 2 to 3 flattish leaves and a many flowered umbel of pink flowers with pale pink filaments and deeper pink anthers. The first two pictures taken by Bob Rutemoeller show it in habitat on the Sonoma coast and a close-up too. The third and fourth were taken by Nhu Nguyen and the fifth by Michael Mace.